Dinner was a surprise. A surprise because of the weather. It was sunny from about mid afternoon and it wasn't meant to be. So we decided to BBQ. D had bought some cedar planks, cooking grade, a couple of weeks ago so it was as good a time as any to put them to use. 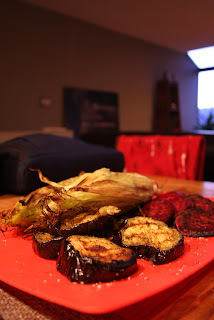 As well, I picked up some organic veg: a big red beet the size of a softball, 2 ears of corn, and we had half an eggplant in the fridge. The veg were sliced and tossed in olive oil and sprinkled with course salt and fresh cracked pepper. 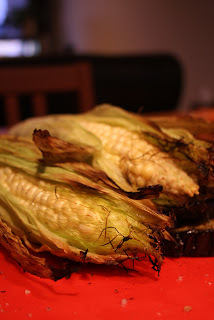 Tore the beards off the corn and soaked them a bit in water. The beets need to go on first. They will take the longest to cook, at least 15/20 minutes. Egg plants will only need 10 minutes. The corn about 15. 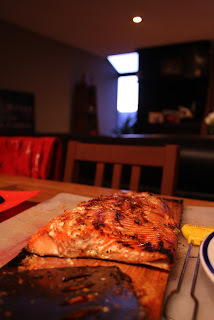 The cedar plank needs to be soaked in water for at least half an hour. Submerge it and keep it under with a bottle. Brush on the marinade on the clean, deboned salmon and let sit. A full half fish filet will take about 3 minutes a side.